The first two and a half were easy. Blind rivets - not too much can go wrong. The third frame, however, has a very beefy structure on top. That can mean only one thing: it is going to have a very important job to do, and will therefore require big, fat #4 solid rivets. Ok, it means two things. It will have a very important job to do, it will require big, fat #4 solid rivets, and they will be a bear to squeeze. Ok, it means three things. So, what's the critical function that will be the responsibility of the upper half of the smallest frame? Funny you should ask. That extension coming from the top of that frame is where the four bolts that hold the vertical stab and rudder will go. 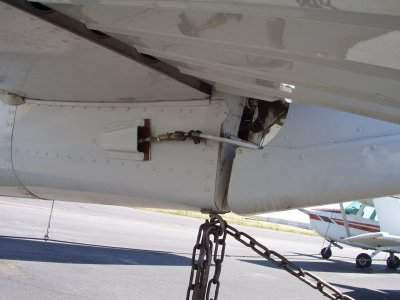 Given that the plane probably can't fly without the vertical stab, keeping a tight grip on it is an important role indeed! I know I make it look easy, but really, you should consult your physician before trying this yourself. Facial contortions lasting longer than four hours should be considered a medical emergency. Note also the 5/16" drill bit that will be used to pre-drill the hole into the part. The masking tape marks one inch of depth.